Ha – I bet I sounded just like one of those “Pirates of The Caribbean” movie characters. 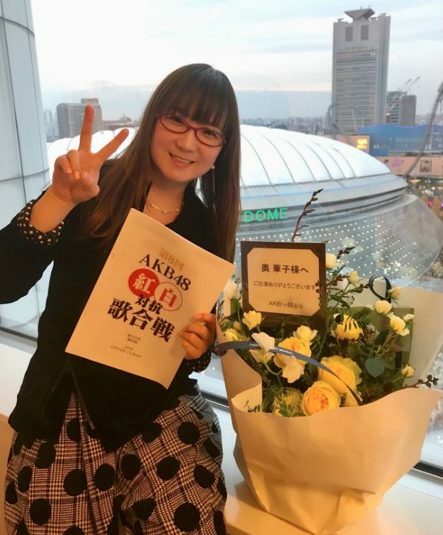 I think that they have a new movie … or something coming out … or recently. I really don’t follow that series. I heard it was going to be “Rated R” … because it is about pirates … and … see … and pirates say “AHHRR” a lot … and hoo boy. Dhelmise (in Japanese: ダダリン “Dadarin”) is a dual-type GHOST and GRASS-type Pokémon introduced for the Alola Generation VII (source: Bulbapedia). Dhelmise is genderless, and does not evolve into or from any other known Pokémon. 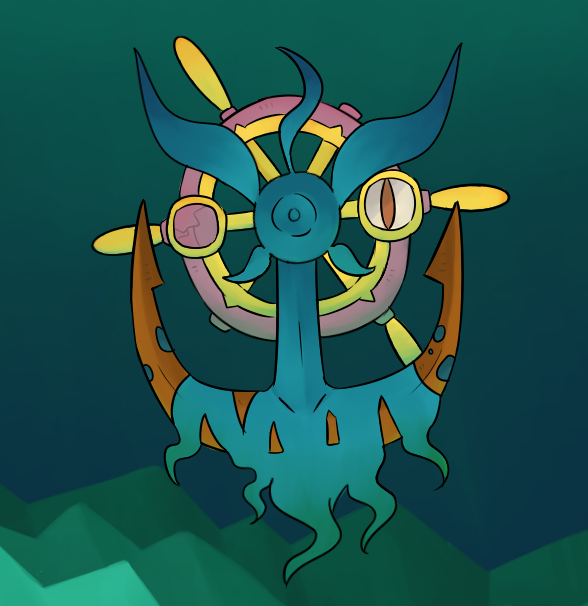 Basically, Dhelmise is the rusty anchor of a sunken ship, combined with the ships (steering) wheel — and covered in seaweed. One of its eyes appears to be a compass. (A full description from Bulbapedia is linked here.) Although Dhelmise is ghost and grass (seaweed) it is surprisingly not a WATER-type It can learn moves such as “Whirlpool”. This is appropriate, as I see Dhelmise trying to pull foes down to a watery grave. 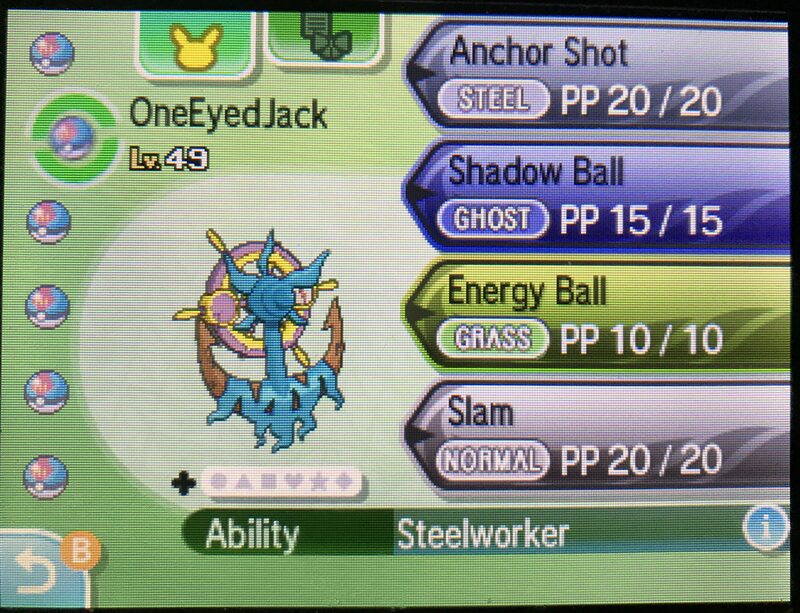 Ha Ha — or as I should say — ARRR … Another odd characteristic about this Pokémon is that its signature ability is “Steelworker” which boosts STEEL-type moves by 50%. That makes sense, as an anchor is made of iron. Thus a good move set for this Pokémon should include Ghost, Grass, Water and Steel moves. 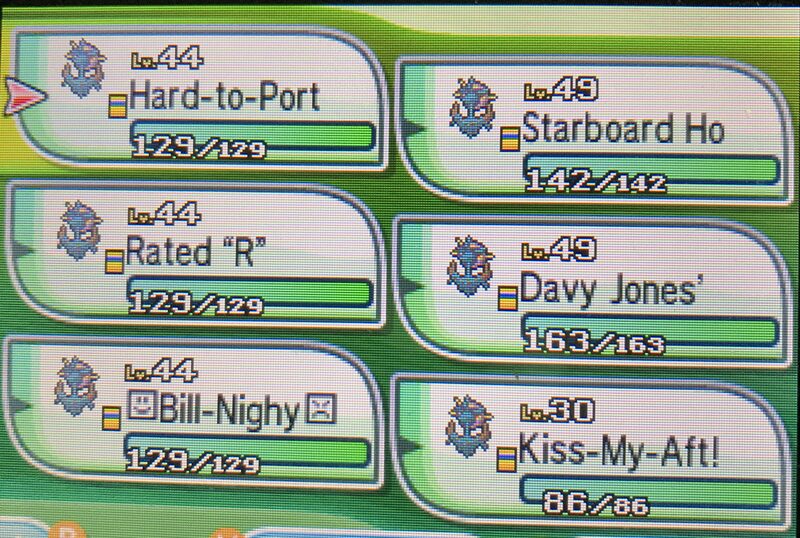 Sailing-type names are cute. Do you know your port-side from your aft? 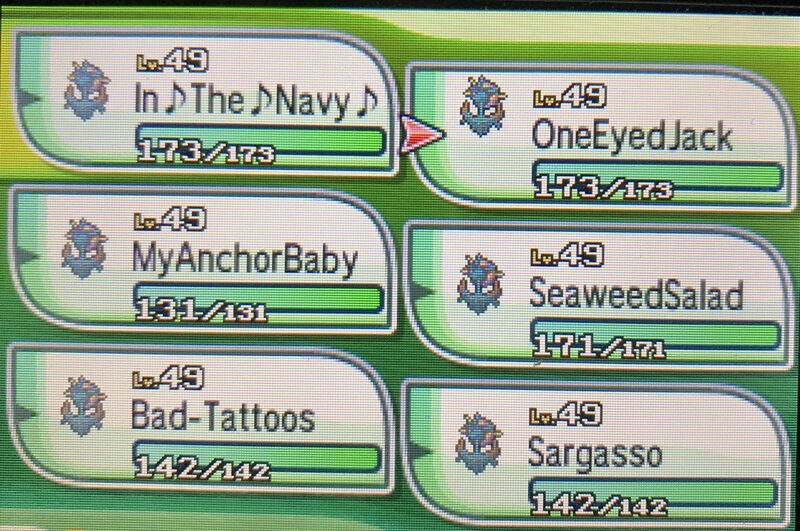 Another fun nickname might be based on the old Village People song “In The Navy” linked here. When you think of sailors you think of the various nautical-themed tattoos that they decorate themselves with. Tattoos are really not my thing personally, but I still admire the art. 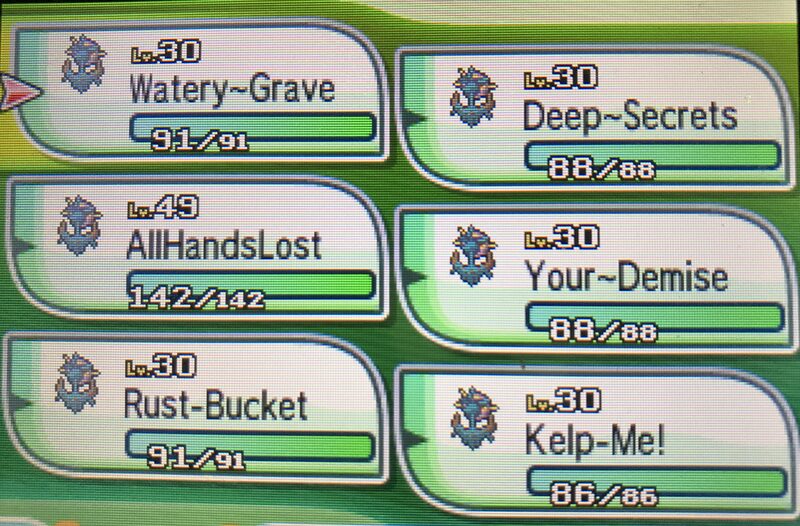 Dhelmise may be hard for Alola adventurers to find. A how-to video from YT is linked here — just don’t use a Quick Ball like that guy, because Quick Balls look stupid, unless your Pokémon is actually blue-and yellow in color. Don’t get me started. Note to my Readers: Since my last post a couple of weeks ago, I have gone over a QUARTER MILLION views on this blog. Take THAT Dave Barry! Shiver me timbers. Congrats on passing 250k hits. Very impressive.